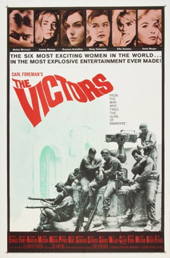 Author Pat Kirkham discusses the opening titles for The Victors, designed by Saul and Elaine Bass, from her authoritative book Saul Bass: A Life in Film and Design. 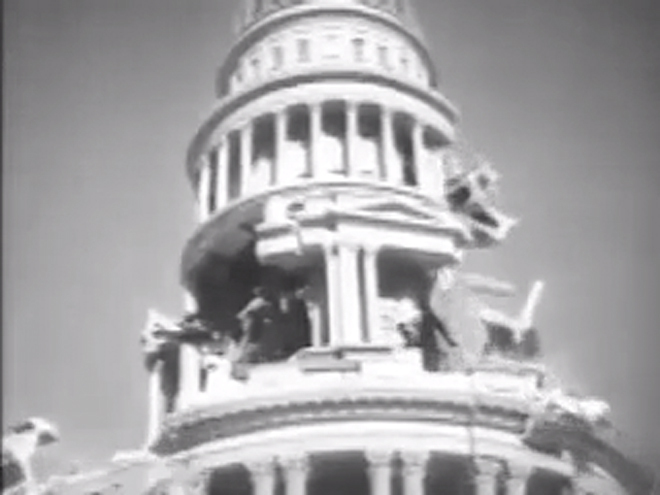 A good example of an opening sequence showing the "time before" is this for The Victors, a ﬁlm set in the immediate aftermath of World War II. It examines the interactions between American GIs and the shattered European survivors whose land they have both liberated and occupied. The prologue covers the previous twenty-seven years of history, from World War I to the Battle of Britain, while in the sequence that follows, also created by Saul and Elaine, the titles are played out against the marching allied armies. Saul and Elaine spent days in ﬁlm archives searching through British, American, German and Russian documentary footage, as well as combat ﬁlm from the U.S. Signal Corps. To ﬁll in the historical and dramatic gaps, they borrowed a few cuts from Sergei Eisenstein's October (1927), and took moments of tumult from the earthquake sequence in the MGM ﬁlm San Francisco (1936, dir. W.S. Van Dyke). They recreated the infamous shot of Hitler dancing a jig after the surrender of France, since the actual footage proved too brief and deteriorated for their purposes. In one of the ﬁnal shots, the recreated Hitler jig is superimposed in miniature over the anguished face of a corpse. Newspaper headlines and clips from Hollywood ﬁlms offer viewers historical markers to guide them through the period. However, it is images such as the unforgettable jig, men shot in action, the hands of a dying soldier grasping at barbed wire, exploding bombs and a close-up of Hitler's mouth in a grotesque Munch-like scream that stick in the mind.